We all know the best San Antonio parties always end up in the kitchen and similarly some of our best stained glass ideas have ended up in the kitchen as well. 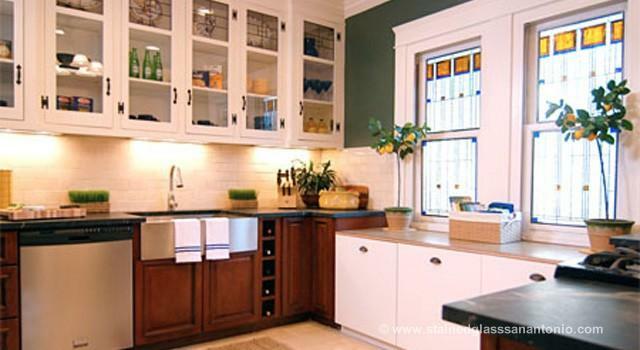 Many kitchen windows face the side of the home and consequently the neighbors house. Our homes in San Antonio are often built closely together. This view is not always the most attractive and additionally can give some homeowners concerns over privacy. The addition of some leaded glass will draw your eyes away from the ugly view and at the same time could stop viewing into your home from the outside. Stained glass allows you to control what you see when you look at your window and in situations where your home may be for sale at some time in the future, hiding an ugly view may be the difference between selling your home quickly or waiting for much longer before the home sells. Scottish Stained Glass in San Antonio will come to your home for a free in home consultation. Call us today.